OAKLAND, Calif. (April 10, 2007) Downtown Oakland’s burgeoning arts and entertainment scene is getting a major boost from new performance venues and unique arts education facilities popping up in and around the Uptown district. One of the key players in downtown’s resurgence is the Oakland Public Conservatory of Music currently being showcased as the “Featured Venue” on www.MeetDowntownOak.com, the City of Oakland ‘s online guide to all that is hip in the heart of Oakland . 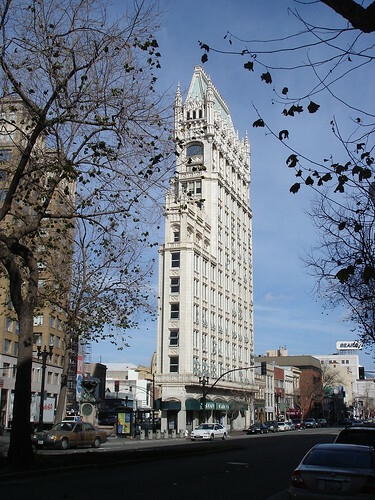 The Oakland Public Conservatory of Music (OPCM) is the only public conservatory of its kind in the nation. The school strives to open the world of music to people of all ages and backgrounds through high-quality, economical music education. Programs and activities include a preparatory program offering conservatory-quality training complete with private lessons, master classes, keyboard and theory classes, in addition to ensembles and performance opportunities; a children’s performing arts camp; teen music mentors; Saturday classes for infants and children; and the Community in music Education Program which offers a variety of classes from Blues Piano to Caribbean music for older teens and adults. The talent of the school’s pupils is highlighted during a variety concerts and special performances throughout the year. The school was founded in 2005 under the dynamic leadership of Angela Wellman. Recently spotlighted in “Woman with a Horn,” an article in the March 25th edition of San Francisco Chronicle, Wellman is a highly-accomplished bandleader and trombone player. In celebration of National Jazz Appreciation Month, “Celebrating the Kid from Red Bank: A Tribute to Count Basie,” will be held on Sunday, April 15, 2007, as part of the Chapel of the Chimes’ “Jazz at the Chimes” Series. Highlighting this OPCM fundraiser will be a special performance by the Count Basie Tribute Orchestra under the direction of Wellman. The orchestra will also feature Count Basie alum and legendary bassist John Heard and pianist Bill Bell. The concert, which begins at 2:00 p.m., will be preceded by a conversation starting at 12:30 p.m. with Orrin Keepnews, founder of legendary jazz recording labels Milestones Records and Riverside Records. OPCM’s observation of National Jazz Appreciation Month will also include a jazz history exhibit featuring photographs and art celebrating national and local jazz artists in the City of Oakland Administration Building, 250 Frank H. Ogawa Plaza, (adjacent to Oakland City Hall) from April 16-30, 2007. Concerts and special performances held at OPCM include the College of Alameda Big Band appearance every fourth Sunday through May at 2:00 p.m.; Youth Music Extravaganza, Friday, April 20, 7:00 p.m.; BMI & The Roster Super Company Bay Area Talent Search on April 28 & 29; End of Semester Student Performance Friday, May 11, 7:00 p.m.; and the Preparatory Studies Program Recital on Sunday, May 20. The OPCM values rigor, innovation and scholarship in its quest to preserve the rich musical heritage of Oakland that dates back to the 1940’s. Oakland has been home to numerous acclaimed musical artists like Ed Kelly, Buddy Montgomery, Robert Stewart, Denise Perrier, The Pointer Sisters, Pete Escovedo, MC Hammer, Dorothy Morrison, Tower of Power , EnVogue, Tony! Toni! Toné!, Ledisi, LaToya London, D’Wayne Wiggins and many others. Tickets to the April 15 OPCM benefit at Chapel of the Chimes are $25-$35 (sliding scale admission) and include the pre-concert talk and a post-concert reception. Tickets may be purchased in advance through www.brownpapertickets.com or by calling OPCM at (510) 836-4649. Doors open at 12 noon. Chapel of the Chimes is located at 4499 Piedmont Avenue , Oakland . This entry was posted on Wednesday, April 11th, 2007 at 7:15 am. It is filed under Music News/Info. You can follow any responses to this entry through the RSS 2.0 feed.